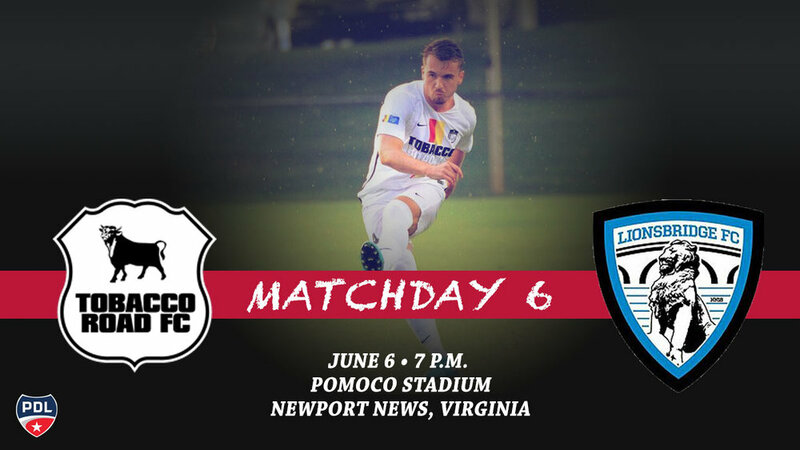 DURHAM, NC – Tobacco Road FC wraps up its three-game road streak as they travel to Newport News Virginia to take on Premier Developmental League newcomers Lionsbridge FC 7 p.m. Wednesday night at Pomoco Stadium. Tobacco Road FC has never faced Lionsbridge FC before and they have no series history. Currently in the South Atlantic Division Standings, Tobacco Road FC sits in fourth with six points on two wins and three losses. Lionsbridge is right behind them with five points on one win, two losses and two draws. Lionsbridge is looking to capture their first division win as their divisional record is 0-2-1. Last time out, Tobacco Road traveled to North Carolina FC U-23s in Cary on a rainy Saturday to completed the latest edition of the Triangle Derby. Tobacco Road struck first in the 15th minute when Oscar Moreno followed up a deflected cross from Dylan Chain. North Carolina FC U-23 forward Sheriff Secka found the equalizer with a quick right footed shot in the 26th minute. Tough physical play continued throughout the pitch as both teams pushed forward to find a winner. In the 89th minute a back-post header from Jelani Pieters found the back of the net to give the hosts the 2-1 win. Lionsbridge FC traveled to Browns Summit, NC to face the Carolina Dynamo. The Dynamo got on the board first in the 12th minute off a free kick into the box. Lionsbridge showed resilience and answered quickly and equalized in the 16th minute. In the 59th minute the Dynamo scored the eventual winner as a corner kick was headed into the net, yielding a 2-1 loss for the visitors. The match between Tobacco Road FC and Lionsbridge FC is Wednesday, June 6 at 7 p.m. at Pomoco Stadium in Newport News, Virginia. Tickets are available online at https://app.soccerstub.com/events/lionsbridge-fc-vs-tobacco-road-fc. A live stream will also be available through YouTube. The link for the live stream will be posted closer to game time on Twitter and Facebook.